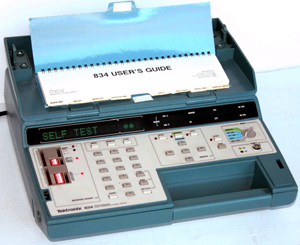 The Tektronix 834 is a portable "programmable data communications tester" (serial protocol analyzer) for RS-232 (V.24) circuits, introduced in 1980. The 835 and 836 are sister models with extra features, introduced in 1986. It can be used as a serial transmission monitor, modem or terminal simulator, or as a bit and block error rate tester (BERT). It supports ASCII, EBCDIC and hexadecimal displays on its 12-character alphanumeric display, for data formats with 5 to 9 bits/ character (including parity), asynchronous or synchronous (including HDLC), from 50 to 19200 bits/s. ROM packs were available to extend the 834's functions for specific protocols. In simulation mode, operation is user-programmable with up to 99 program steps that can reference up to 50 "parameter buffers" (registers). Some standard tests like all-character tests or "quick brown fox" tests are predefined.